Long before the wood-paneled station wagon became the grocery-getter of ’70s and ’80s babies everywhere, it was The Woodie. A true surfer sled, roaming up and down the coasts for the next Big Wednesday. To see some of these stunners in all their halcyon glory, visit the Automobile Driving Museum tomorrow morning for Woodies in the Park. 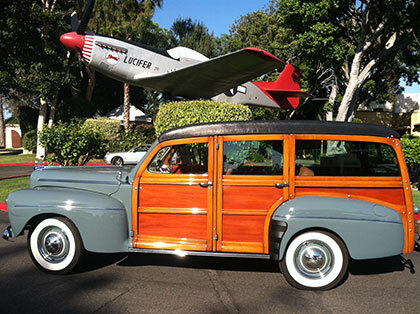 They’ll have more than 50 of the wood-paneled station wagons Brian Wilson immortalized in Surf City on display. Some are restored, like this 1947 Ford Wagon with white-walled tires. Others have been retrofitted with modern doodads and gizmos, like the one up top: a 1947 Mercury upgraded with some serious 4WD giddy-up. Invented by Ford in 1929, these babies only truly remained in production until 1953. After that, charlatan “woodies” with metal frames became de rigueur. In the ‘60s, woodies were cheap and conveyed surfboards with aplomb. From there, they became the reigning emblem of SoCal surf culture. Three of these woodies will remain on display inside the museum, including a ‘47 Ford Woodie Wagon, the company that started it all. If you’ve got one, bring it. Surf bands. Hot dogs. Tacos. Burgers. Vintage Cars. Electric motors. Hope in.